As its name suggests, this butterfly is found predominantly in Scotland where it flies in tall, damp grassland. In sunshine, males fly almost without rest, weaving low through the grass in search of a mate. Very dark brown with a row of black eyespots with white centres on each wing. Eyespots are surrounded by orange. In poorer weather they perch on grass clumps, flying out to investigate any passing brown butterflies. The females are far less conspicuous and spend most of their time basking. 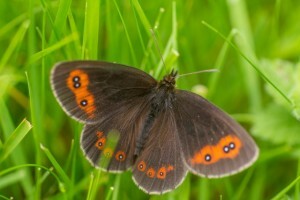 The Scotch Argus is common and widespread in Scotland but has declined in the southern part of its range, especially in England where it is reduced to just two isolated sites. The main food plant in Scotland is thought to be Purple Moor-grass (Molinia caerulea) which occurs in damp, acid or neutral grassland up to 500 metres and around the fringes of sheltered bogs, in woodland clearings, and young plantations. August is the best month to see this butterfly on the wing and look out for the double spot figure eight on the upper wing.